Mnemogogo is a plugin extension for the spaced-repetition flash-card program Mnemosyne. It enables cards to be reviewed on a mobile phone. Mnemogogo does not replace Mnemosyne—cards are still added and edited at a computer. Rather it adds the ability to export several days worth of scheduled and new cards to a mobile device, like a phone or palm pilot, where they can be reviewed and graded before eventually being imported back into Mnemosyne. Unfortunately, there is no support for iPhones. If necessary, download and install Mnemosyne 2.x. Start Mnemosyne, choose Settings/Manage plugins..., then click Install new plugin and select the file downloaded in the previous step. From the Cards menu, select Mnemogogo. Select the Options panel, see Figure 1. Figure 1: The Mnemogogo options panel. Choose the number of days to include in the export. I recommend choosing between 5 and 8 days. More days means less frequent updates, but also that exports will take more space and time to store and load on your phone. If you choose too many days, it may not be possible to run the client software on your phone at all. Choose a directory to save the exported cards. This directory must either be on your phone, or, if not, it must be later copied or synchronized with your phone. More detailed instructions are given below. Usually, it is most convenient to mount your phone's SD card (as a USB mass storage device) and to export directly to a folder within it. For Mnemojojo, the Java client, it is usually best to export directly into a top-level directory called cards on your phone or SD-card. 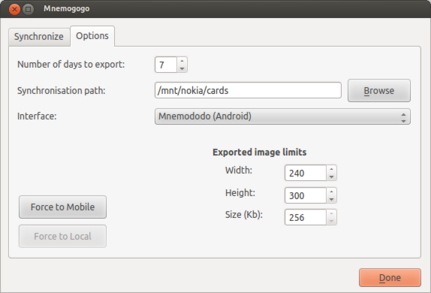 For Mnemododo, the Android client, it makes no difference where the cards are exported. If you have a Java-enabled phone then choose the Mnemojojo interface. If you have an Android phone then choose the Mnemododo interface. Fill in appropriate maximum values in the Exported image limits section. These values are used solely to tune the images exported to your mobile phone so that they will fit on the screen and within the available memory. The export and mobile clients will work regardless of whether the numbers are accurate or not. From within Mnemosyne, open the Mnemogogo panel; see Figure 2. Figure 2: The Mnemogogo main panel. Click the export button to export cards and statistics to your phone. This will also (temporarily) prevent reviewing within Mnemosyne, but it will still be possible to add, edit, and delete cards. It is not possible to simultaneously review cards on your PC and on your mobile phone. Note that Mnemogogo only exports active categories. Categories can be activated or deactivated from within Mnemosyne (From the Cards menu: (De)activate cards...). If necessary, copy the exported subdirectory onto your mobile phone. Safely unmount your phone and disconnect it from your computer (you may need to disconnect from both the computer and from the phone itself). You are now ready to review the exported cards on your mobile phone, per the instructions for Mnemododo (Android) or the instructions for Mnemojojo (Java). After reviewing cards on your mobile phone, the statistics need to be imported back into Mnemosyne. First, make the cards directory available on your PC at the path configured in the Options panel; either by mounting it appropriately, by copying the folder manually from the phone, or by running synchronisation software. Then start Mnemogogo and click the import button. For further mobile reviews, simply repeat the above steps. In particular, click export immediately after an import, and resynchronize, in order to continue mobile reviewing with updated cards. Some phones, like the Nexus 4 and the Samsung Galaxy S3, S4 and Note, do not enable the mount as USB Mass Storage Device option, which is the easiest way of exporting from and importing to Mnemogogo. They instead provide the MTP protocol, which is not really well supported by Windows, Mac, or Linux. In particular, programs like Mnemogogo cannot simply use it to access files using the standard interface that has existed for decades (file open, write, and close). Instead, they receive strange errors like The folder name is not valid. Complaints about this situation abound on the internet. So, how do you get the files exported from Mnemogogo onto your phone? I have four suggestions. Please mail me if you have any others. Copy manually with Windows explorer. Manually move your SD card between your phone and computer. Use the synchronization software that came with your phone. Use a cloud synchronization service. Use a third-party wireless transfer app. Many people will wonder why Mnemododo does not provide an in-built synchronization feature. Mnemododo is focused on reviewing cards exported from Mnemosyne. The design relies on other software to transfer files back and forth. This works very well for phones that can be mounted as USB Mass Storage Devices. The process is simple, fast, reliable, secure, and does not expose your data to any third parties. For phones without this feature, the procedures given below should help. If not, please do not hesitate to contact me. Of all the platforms, Windows provides the best support for the MTP protocol, but, for some reason, the standard file access mechanism is not provided to programs like Mnemogogo. The work-around is to export/import locally and to manually copy back and forth using Windows explorer. At your phone: quit Mnemododo using the back button. At your computer: export from Mnemogogo to a folder on your Desktop. At your computer: after connecting your phone, drag and drop the folder from your desktop into a folder on your phone. If necessary, choose to replace all existing files. 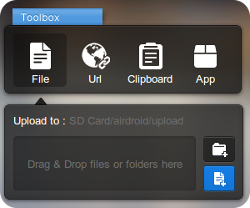 At your computer: drag and drop the folder from your phone onto your Desktop. Choose to replace all existing files. At your computer: import from the newly-copied folder with Mnemogogo. Put the SD card into your computer and wait for it to appear. At your computer: import/export from Mnemogogo into a folder on the SD card. At your computer: safely unmount the SD card. Put the SD card back into your phone and wait for it to be mounted. Many phones come with proprietary synchronization software that can be used to copy files back and forth between your computer and phone. This feature can be used to transfer files between Mnemogogo and Mnemododo. Note: it would seem that Samsung's Kies application is not very good at transferring folders. Please let me know if you have any success with it! Export from Mnemogogo to a folder somewhere on your computer. Use the synchronization software to copy this folder onto your phone. At your computer: use the synchronization software to copy this folder back onto your phone replacing the files that were exported before. At your computer: use Mnemogogo to import this folder. There are many services, like DropBox which can synchronize your computer and phone with online storage. They can be used to copy files back and forth between your computer and phone. Note that Google Drive cannot (yet) be used for this purpose: it only works on newer Android phones and it is not properly supported on Linux. You will need to configure the cloud storage software on your computer to synchronize a folder. You will also need to install the related app on your phone and configure it to synchronize with the same folder. At your phone: if necessary, quit Mnemododo using the back button. At your computer: export from Mnemogogo into the synchronized folder. At your phone: wait for the new contents to appear and then start Mnemododo. At your computer: wait for the folder to synchronize completely, then import into Mnemogogo. Several apps that can transfer files to and from your phone over a network are available. These instructions describe the steps for AirDroid, but other apps should work in a similar way. Important! 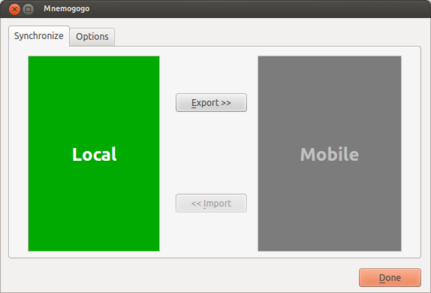 : AirDroid requires the Chrome web browser to upload entire folders, and thus to work properly with Mnemogogo. At your phone: start the app. It should give a URL (like http://1.2.3.4:8888) that you can use to connect to your phone. At your computer: type this URL into a web browser. You will then normally need to accept the connection at your phone. At your computer: export from Mnemogogo into a folder on your computer. Figure 3: The AirDroid upload panel. Very important! : Do not use the other upload buttons, they do not seem to transfer files without file extensions, so files like CARDS and CONFIG are not transferred. At your phone: start Mnemododo. At your computer: from within the AirDroid interface, locate the folder you transferred earlier (normally under .../airdroid/upload), right-click on it and choose Download as ZIP. Open the zip file and copy the downloaded folder over the top of the original folder on your computer, choosing to replace all the files. Import the newly replaced folder using Mnemogogo. The filenames of the exported files and directories (STATS.CSV, IMG, etc.) are in lowercase on the phone. All of the filenames must be in UPPERCASE letters. If you are using Linux, you may have to add the shortname=winnt option to the entry in /etc/fstab for the SD card filesystem. Help! My phone crashed and now Mnemododo complains that ‟The exported cards are corrupt”. This indicates that your phone crashed so suddenly that Mnemododo was not given enough time to fully write the STATS.CSV file. You should be able to recover most reviews by copying STATS.BKP over the top of STATS.CSV and restarting Mnemododo.